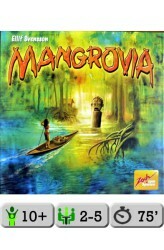 In Mangrovia, a light "gamer's game"/family game with a Caribbean mangrove setting, a clever role selection mechanism allows the players to choose two different bonuses/actions as well as the turn order in which they want these actions to be carried out — all by placing just one marker. Victory is achievable through a number of viable options, which guarantees high re-playability. The game is a fight over acquiring the best locations for your huts in this appealing and unspoiled landscape. If you manage to do so, you will become the rightful successor of the old chief and win the game. You gain Chief points by having the most huts (and the secondmost huts) along each of the eight divine paths monitored by the statues of Gods. Additional Chief points are earned b..
Barges, freight and profits are what it's all about in Manila, a speculative contest for 3-5 players. Goods shipments, intended for transport along sea routes, are in danger of gathering dust in the warehouses or being lost at sea in a storm. While the players speculate about success and failure, the ultimate fate of the ships will be determined by the dice. 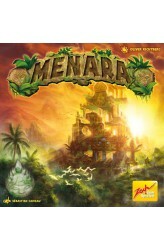 https://www.youtube.com/watch?v=ykc13f7HPnw ..
As a tight-knit team in Menara, players use pillars and wondrously-shaped temple floors to build a spectacularly soaring structure full of nooks and crannies. Cooperation and static skills are in demand since for each mistake in construction, you have to add another floor to the temple. A steady hand, an alert mind, and mutual assistance can help you successfully complete what seems to top out at dizzy heights... https://www.youtube.com/watch?v=KpkySN9gHr0 .. 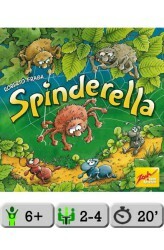 In Spinderella, players race to get their three ants across the forest floor as quickly as they can, but spiders await in the branches above and — with a little help from opponents — one might swoop down to scoop up your ant and return it to the starting line. You can do the same to them, of course, so search for the right time to act and the right places to hide. 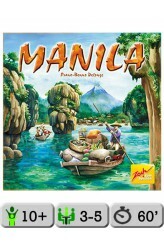 Awards: - 2015 Winner of Kinderspiel des Jahres https://youtu.be/aNaCNEqgDgw ..